Modern fencing has its roots in the historical traditions of swordsmanship. 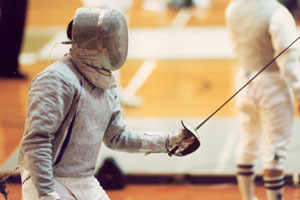 Two opponents contest an assault or bout using one of three weapons: foil, épée, or sabre. Objective: The main object of a fencing bout (what an individual "game" is called) is to effectively score 15 points (in direct elimination play) or five points (in preliminary pool play) on your opponent before he scores that number on you. Each time a fencer scores a touch, she receives a point. Direct elimination matches consist of three three-minute periods. A foil is the modern version of a rapier. It is about 35-in (88.9 cm) long and weighs less than 1 lb (.45 kg). It is a point weapon, which means that only the point of the blade can score a valid touch. The foil evolved during the late 17th century as a practice weapon for the small sword. The word is derived from the French word refouler, meaning "to turn back". 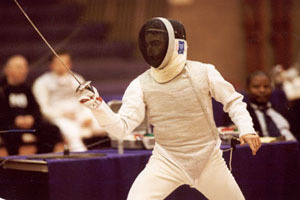 The foil is a thrusting weapon, so only the point of the foil may be used to score a touch.The target area for a foil is the torso (the area covered by the jacket), not including the head or arms. Any touch scored outside of the target area (off-target) is not valid. Sabres are descended from naval and cavalry swords of the late 19th century. But modern sabre fencing has developed into a lightning fast game of cuts, stop-cuts and parries that would be impossible to achieve with historical sabres. Modern sabres are similar to a foil in length and weight, but with a large guard that covers the the knuckles. It is a point weapon and a slashing or cutting weapon; therefore, the side of the blade can make a valid hit. The target area for a sabre is the everything above the waist including the head and arms. Because the hand and arms are valid targets for a slash, the bell guard of the sabre is also curved downward in front to protect the fingers. Sabrists, like foilists, must adhere to the right-of-way rules. In addition, the correct timing of actions is often considered more difficult in sabre than in the other weapons. Epee is the modern version of the dueling sword; it is similar to a foil, but it has a stiffer blade, has a larger bell guard, and is heavier (about 1.75 lb, or .79 kg). The epee evolved in 19th century Europe as the premiere dueling weapon replacing its predecessor, the small sword. Epee is the French word for sword. 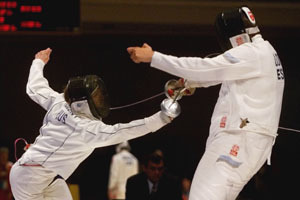 In Epee, the first person to hit is awarded the touch, regardless of priority. Double hits are possible, if they both arrive within 1/25 of a second of each other. The sport of epee fencing was developed to mirror the conditions of an actual duel in that the object of the encounter was to score "first blood". The epee is a thrusting weapon only, so touches must be scored with the point. The target area for an epee fencer is all of their opponent's body. Literally anything on you is a target as opposed to foil or sabre whose target area is specifically define. This causes an epee fencer to be more careful when they make an attack so that they do not get hit while doing so. The bell guard on an epee is larger for this reason. Since the closest target to your opponent is your hand, it needs to be protected. The hand is an avidly attacked target on an epee fencer and must be protected well. The epee tends to be the more cautious of the weapons. 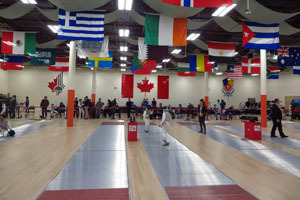 Fencing normally takes place on an flat and evenly lit playing surface known as the Piste.Various surfaces are permitted: wood, linoleum, rubber, plastic and metallic mesh. 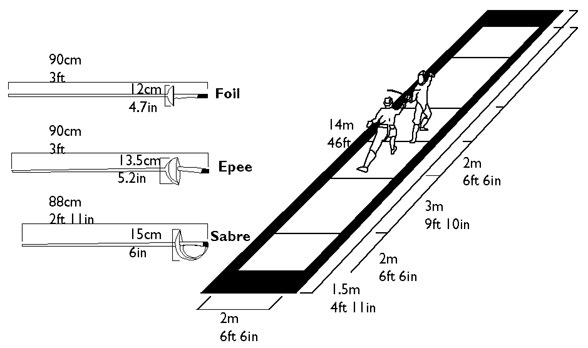 Whatever the surface that is used, the width of the piste is constant, its length is 14m with 2m each end run off. Woodhouse Eaves Fencing Club runs taster sessions and beginners courses during September and January for those wishing to try the sport. For more information, please email the club and/or see our facebook/twitter feed for dates. Alternative drop us an email.